I’m thinking of getting a rabbit. Do you have any tips for me? Rabbits are clever and social animals that become wonderful pets. They need affection, and they like to live in the house with their human family. If you ever had a puppy, kitten, or even a human baby, you probably looked over your home to make sure it was safe. Do the same for your rabbit. Bunny-proofing will keep your new furry friend away from harm – and protect your favorite things. Rabbits like to chew. Their teeth are always growing, and chewing helps keep their teeth trimmed. Suitable things to chew include dry branches from an apple or willow tree, compressed alfalfa cubes, and hay. Be careful what type of wood you provide – fruit tree branches such as apricot and peach are toxic while attached to the tree, but not after they’ve been cut and dried for at least a month. Any baskets should be willow – other materials may be sprayed with pesticides. If rabbits don’t have safe things to chew on, they may very well focus the energy on furniture, drapes, shoes, or even electrical cords. Any exposed cords should be encased in vinyl tubing. Split the the tube lengthwise with a hobby knife and push the cords inside. Chewing on carpets can lead to ingesting carpet fibers, and this can be a health hazard. Your bunny will also need attention and toys. A cardboard box filled with hay can provide hours of entertainment. Just like other species, baby bunnies are more likely to think of mischief than adults. Most rabbits will use a litter box, like a cat. When you bring your new bunny home, start with a small space that will be “theirs” – it can be a large dog crate, a bunny proofed room, or a large cage. Keep the litterbox in a corner, and give praise and treats when bunny uses the box. Never punish. When your rabbit gets more freedom in the house, you may need to add more litter boxes. House rabbits usually get along well with both well-mannered dogs and cats, but monitor the interactions. Both dogs and cats can see the bunny as prey or as a fun toy. It is important to know that rabbits can get hairballs just like cats do, but rabbits can’t throw them up like a cat would. 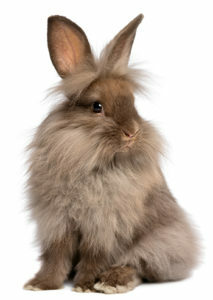 If your bunny swallows a lot of hair, they can develop an intestinal blockage and require surgery. Help them out through brushing, make sure they get ample exercise, hay, and fresh vegetables. Also consider that a pet rabbit has about the same lifespan as a dog – many live into their teens. Make sure your family is ready for the commitment.